Riyadh: Al Qaida in the Arabian Peninsula (AQAP) has pledged revenge against Shi’ite Al Houthi rebels in northern Yemen for their assault on a Salafi school in Dammaj, Site Monitoring Service reported late on Tuesday, citing a statement from the group. Fighting between Al Houthis and Salafis in the traditional Dammaj school, in the heart of Shi’ite territory, caused more than 100 deaths over the past two weeks and threatens to cause more sectarian tensions in Yemen. The impoverished Arabian Peninsula state faces a host of political troubles, including the Al Houthi rebellion, an Al Qaida uprising, splits in the military and a southern separatist movement. Western countries fear further turmoil could create more space to operate for AQAP, already seen as one of the most dangerous Al Qaida branches after it plotted attacks on international airlines in a country that sits alongside big oil shipping routes. AQAP’s warning it would seek revenge was contained in the transcript of a video recording by Harith Bin Ghazi Al Nadhari, a religious official in the militant group, and posted by Yemeni journalist Abdul Razza Al Jamal on his Facebook page, Site reported. “We declare our total solidarity with our Sunni brothers in the centre in Dammaj, and in other Sunni areas that the Al Houthi group had attacked,” said Harithi’s statement. “Your crimes against the Sunni people will not pass without punishment or disciplinary action,” it added. The statement also attempted to place the fighting in northern Yemen in the context of a wider Middle East sectarian struggle, comparing it to the war in Syria where Sunni rebels are fighting the government of President Bashar Al Assad, who belongs to the Alawi sect, a Shi’ite offshoot. “It is a siege no different than that imposed upon Gaza or Homs or the Damascus countryside,” Harithi said. Salafis in Dar Al Hadith, the Dammaj school, have previously distanced themselves from Al Qaida and criticised Osama Bin Laden, but the seminary has also educated Muslims who later became prominent militants. 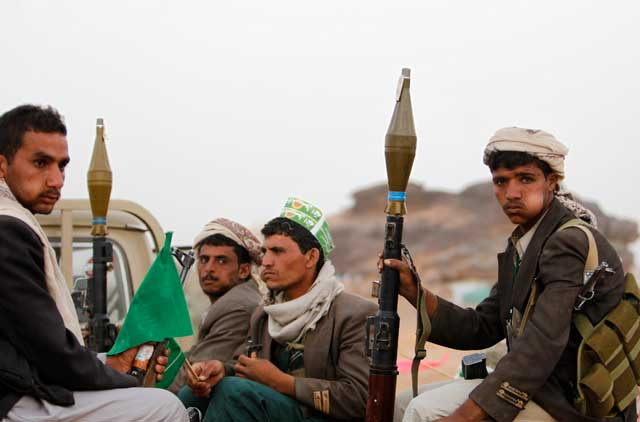 The Al Houthi rebel movement emerged in the early 2000s, claiming it would fight against what it saw as the marginalisation of Shi’ites of the Zaydi sect, which prevails in the Yemeni highlands. One of its grievances was the encroachment of Salafi doctrine in Zaydi areas.